Product prices and availability are accurate as of 2019-04-04 00:18:03 UTC and are subject to change. Any price and availability information displayed on http://www.amazon.com/ at the time of purchase will apply to the purchase of this product. Well known for their pre-seasoned cast iron skillets, Lodge has perfected their formula and designs for optimum performance. 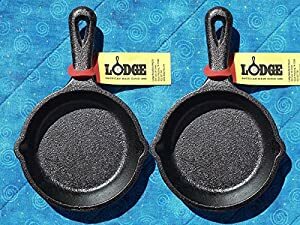 This Lodge pre-seasoned miniature skillet is the perfect size for silver dollar pancakes or eggs. The pre-seasoned 3-1/2" cast iron skillet heats evenly and more consistently than any other material used in today's restaurants. Because it is pre-seasoned you don't need to take the time to prepare your pan, instead you can use it straight out of the box! Other uses include: • Spoon Rest • Ash Tray • Bake individual Biscuits/Cookies • Warm Olive Oil • Decoration. Proudly Made in the USA!